Light-by-light scattering is a very rare phenomenon in which two photons – particles of light – interact, producing another pair of photons. This process was among the earliest predictions of quantum electrodynamics (QED), the quantum theory of electromagnetism, and is forbidden by classical physics theories (such as Maxwell's theory of electrodynamics). Direct evidence for light-by-light scattering at high energy had proven elusive for decades, until the Large Hadron Collider (LHC) began its second data-taking period (Run 2). Collisions of lead ions in the LHC provide a uniquely clean environment to study light-by-light scattering. Bunches of lead ions that are accelerated to very high energy are surrounded by an enormous flux of photons. Indeed, the coherent action from the large number of 82 protons in a lead atom with all the electrons stripped off (as is the case for the lead ions in the LHC) give rise to an electromagnetic field of up to 1025 Volt per metre. When two lead ions pass close by each other at the centre of the ATLAS detector, but at a distance greater than twice the lead ion radius, those photons can still interact and scatter off one another without any further interaction between the lead ions, as the reach of the (much stronger) strong force is bound to the radius of a single proton. These interactions are known as ultra-peripheral collisions. The ATLAS Collaboration has reported the observation of light-by-light scattering with a significance beyond 8 standard deviations. Today, at the Rencontres de Moriond conference (La Thuile, Italy), the ATLAS Collaboration reported the observation of light-by-light scattering with a significance of 8.2 standard deviations. 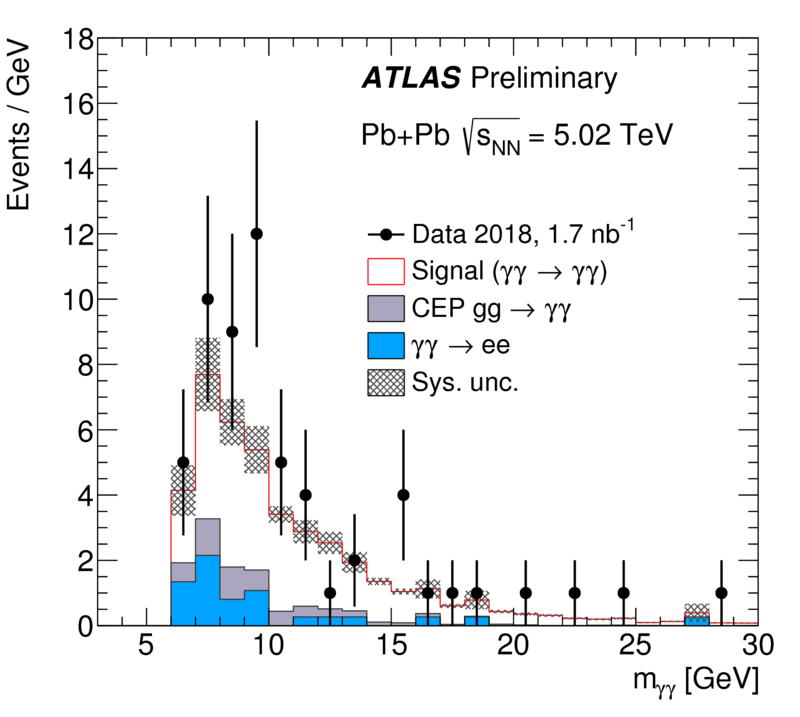 The result utilises data from the most recent heavy-ion run of the LHC, which took place in November 2018. About 3.6 times more events (1.73 nb−1) were collected compared to 2015. The increased dataset, in combination with improved analysis techniques, allowed the measurement of the scattering of light-by-light with greatly improved precision. A total of 59 candidate events were observed (see Figure 2), for 12 events expected from background processes. From these numbers, the cross section of this process, restricted to the kinematic region considered in the analysis, was calculated as 78 ± 15 nb. This new measurement opens the door to further study of the light-by-light scattering process, which is not only interesting in itself as a manifestation of an extremely rare QED phenomenon, but may be sensitive to contributions from particles beyond the Standard Model. It allows for a new generation of searches for hypothetical light and neutral particles.